The press meet, audio release and introduction of the 'O Kadhal Kanmani' team took place at a five-star hotel in Chennai on April 11. The event started late and Mani Ratnam preferred to be tight-lipped about the content of the film. It was only lyricist Vairamuthu who added some spice to the event by saying that 'OK Kanmani 'is an experimental film and will create cultural tremor in society. Mani Ratnam ducked all questions from media and said that he should have warned Viaramuthu not to say such things! Dulquer Salmaan looked all excited and he shared his experience on working with Mani Ratnam. “I was an ordinary student at school but when I got this offer in 'OK Kanmani,' it was like getting into IIT or IIM,” said the young actor. While addressing the function, Mani Ratnam thanked his entire team for their kind support. When asked whether 'OK Kanmani' revolves around living-in relationships, Mani Ratnam asked the media to wait for the release. 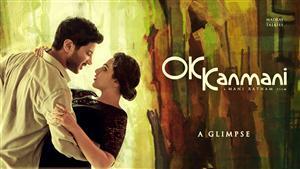 On April 17, Studio Green will be releasing 'OK Kanmani' in more than 350 screens in Tamil Nadu.